Message "Living as God's friends"
"Sing to the Lord, a ‘new’ song." That’s what the psalm calls us to do. Now "Joy to the world" is not exactly a ‘new’ song. Nearly 300 years ago Isaac Watts wrote the words to this hymn, basing them on Psalm 98. A century later, Lowell Mason composed the tune which, if you listen, you may hear some phrases (like the first four notes) that he borrowed from Handel’s "Messiah." No, it’s not a ‘new’ song, but it turns us in a ‘new’ direction, if we allow the Lord to come and prepare room in our hearts today. This isn’t just a song for Christmastime - it’s a ‘new’ song for all time. Let’s stand and sing our joy and praise. Lord, thank you for planting this ‘new’ song in our hearts. Although we still long for the fulfillment of all your promises - the new heaven and earth you will one day reveal, we are filled now with the joy and wonder of your salvation in your Son. He lives! His blessings flow! He rules the world with grace and truth! May these words become in us this hour more than mere words on a page. Empower this hour with your Holy Spirit that your children gathered here might grow deeper in our relationship with you and with each other. This we pray, in the name of the One who calls us "friends" - Jesus Christ. Amen. We go by many titles as we walk by faith. We are a "sister" or a "brother" in Christ. Furthermore, each one who responds to God call is a "servant," one who serves in Jesus’ name. Another important title is "children of God," or more specifically - a "daughter" or a "son" of God, whom Jesus - through the cross - has brought into a right relationship with our eternal parent, our "Father" in heaven. Yet another name we claim as those baptized in the water and the Spirit is "friend," which is the theme of our worship today. In Jesus Christ, we live as God’s "friends," so named by Jesus himself. At this point in worship we want to celebrate an important milestone for one "sister," a "servant" among us, a "daughter of God," a "friend." Last Thursday, ________ graduated with a bachelor’s degree from Towson University. Would you come forward, ___? ... Not all that long ago, you moved back into our community, after journeying to California and Virginia. The path that led you here was not an easy one, yet you have walked it with courage and grace. We are thankful that God has brought us together, and glad that the Lord has empowered you to complete this step in your journey. We have sought to be supportive "sisters and brothers," "servants," fellow "children of God,"and "friends" to you, along the way. As we congratulate you, we praise God for the guidance and strength with which we all are provided to accomplish that particular calling to which each of us is called. Now, speaking of calling, I want to give you a chance to say a few words, perhaps sharing with us where your path with God seems to be leading you from this point. _____? Now, at this point would ______________ please come forward? ... ______, we weren’t sure if you were going to be able to be with us this morning. Very soon, you will be leaving this area. For those who might not know _______, she has been in the United States for (how many?) ___ years on a student visa, which is expiring. The home to which she is returning is Sao Paulo, Brazil - the same city ___________ is from. _______, we want to take this opportunity, as representatives of the church of Jesus Christ, to "send" you forth. Yes, it’s our government which is telling you it’s time to go home. Of course, you can re-apply to return - a process which has become more complicated since September 11th of 2001. The underlying truth, however, is that God is leading you, not just a government. The Lord opened doors for you to come here, as you have shared. Prayers were answered. Believers in Sao Paulo surrounded you with prayer even before it became clear this door would open, some even telling you to start packing. Heavenly Father, you have proved so faithful in the years leading up to this point in the lives of both of these women. We thank you for providing each one what they have needed. 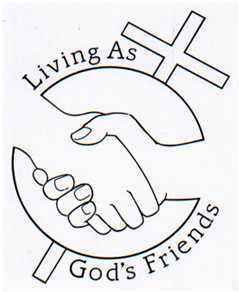 We thank you, also, for the privilege of being friends in Christ to them - for as much or as little as we have. In beholding what you have thus far accomplished in them, we are encouraged to step out by faith into the directions that you are calling and empowering each of us to travel. Today is, in many ways a graduation day for both of them, for they step forth onto a new path, listening for your call. Bless their steps from this point onward. Help them to walk in your Way, daily seeking you. Go with them, and ahead of them. Be their present strength, their hope, their continuing salvation. This we pray in the name of the One who promised, "Lo, I will be with you always, even to the end of the age." Amen. Heavenly Father, you have proved so faithful in the years leading up to this point in the lives of our sister and friend. We thank you for providing her what she has needed. We thank you, also, for the privilege of being friends in Christ to her - for as much or as little as we have. In beholding what you have thus far accomplished in her, we are encouraged to step out by faith into the directions that you are calling and empowering each of us to travel. This week she steps forth onto a new path, listening for your call. Bless her steps from this point onward. Help her to walk in your Way, daily seeking you. Go with her, and ahead of her. Be her present strength, her hope, her continuing salvation. This we pray in the name of the One who promised, "Lo, I will be with you always, even to the end of the age." Amen. O God, whose grace does indeed surround all our days, you have proved faithful along every step of our journey thus far. Even when we cannot see the imprint of your feet, we know you are with us, as surely as you have traveled with those who have gone before us. We thank you for the inspiration of their lives. We remember them. However, it is you that we worship, O Lord. As our nation pauses to remember those who have served in the military, many giving their lives for something larger than themselves - be it country, freedom, or simply friends and family, we honor their devotion. We remember them. However, it is you that we worship, O Prince of Peace. Are we giving our "all" to you? Are we willing to set aside our own personal agendas, to give up that which is temporary for that which is eternal, to lay aside our lives for something bigger than ourselves? We confess our reluctance, Lord. We are still learning the meaning of what your Son said, "Those who try to make their life secure will lose it, but those who lose their life will keep it" (Luke 17:33). Our actions too often build up our own temporary security, and do not move in the directions in which you lead. Remembering the cross, O God, forgive us, and live in us through the Holy Spirit, that we might give out of us the treasure you have planted within. You have heard our sharing just now. We’ve caught a glimpse of your presence in each person mentioned, each situation lifted up - whether it be cause for celebration or intercession. Continue your work throughout, O Lord, and help us to see you more clearly, as we seek to love you more dearly and follow you more nearly. All this and more, we pray in the name of our Lord, Savior, and friend - Jesus Christ. Amen. "The king will say to them, ‘Truly I tell you, just as you did it to one of the least of these who are members of my family, you did it to me’ (Matthew 25:40). Yes, we come to the Lord just as we are. Sometimes we do what’s right, extending the friendship of God to others, and those words of Jesus bless and surprise us. Other times, we blow it and those words sting, for we have not been a good friend to those who need a friend. As you respond to the good news with your tithe or offering, ponder what you might do this week to be a good friend to at least one person, extending the friendship of God. As we then stand to sing the final two verses of "For the beauty of the earth," resolve to live out those joyful words - "friends on earth and friends above" - just as you are: welcomed, pardoned, cleansed, relieved. Will the ushers come forward to serve. From the book of Proverbs comes this nugget of wisdom: "Some friends play at friendship but a true friend sticks closer than one's nearest kin" (Proverbs 18:24). May God bless and empower you this week to stick with it and be a true friend to someone else, fully trusting in the One who is your Lord, your Savior, your friend - Jesus Christ. Amen.